As a little girl, I would look forward to visiting Grammy's house. She had a small red and white kitchen with wonderful red countertops. Her recipe box was always there. Solid oak, practical, sturdy and reliable, the box has her maiden name initials on the front (she didn't marry until her late 20's). When I was 10 years old, my mother and her two sisters let me have the recipe box when my Grammy passed away from ovarian cancer. I lost one of my best friends when she passed, and I clung to special mementos of her like this box. Over the years, I've cherished the recipes inside but only opened it just to finger through them and catch a glimpse of Grammy's handwriting. The box is full of recipes that span from around 1910 through the 1970's. The older recipes, written in fountain pen, are yellowed with a wonderful aged patina. Some have splatters of batter on them. Some are missing corners or the ink is smudged. Some recipes are actually dated with the name of the person who introduced the recipe to my Grammy. I was pleased to find some that belonged to my great-grandmother (Grammy's mother, El) as well as my Grammy's Aunt Esther. I wonder if those recipes once resided in El's or Esther's recipe boxes before taking up residence in Grammy's. Very few, if any, of the recipes are illustrated. I think I've only witnessed a handful of these recipes being made in my presence--if that. Most of the recipes are for foods that I've never seen or tasted. Despite those two deterring facts, I still want to cook each recipe in the box. I have a feeling this culinary journey will prove to be quite an adventure. 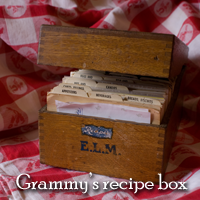 If you use a recipe or cooking tip from Grammy's recipe box, I'd love to hear about it.